If you’re only going to be in a city for one night and want to make it one to remember, you’re in luck. We’ve compiled the ultimate cheat sheet packed with the top must-see activities, attractions, restaurants and bars in Canada’s major cities. No trip to Vancouver is complete without a visit to Stanley Park. Walk along the Sea Wall promenade and ditch the crowds for some alone time on the park’s meandering nature trails. Then make your way over to the Prospect Point Café for a drink and an amazing photo op of the Lion’s Gate Bridge. Remember: no duck face. After you’ve worked up an appetite, indulge in a great dinner at The Teahouse Restaurant. Or, bid farewell to Stanley Park and savour the delicious, locally sourced cuisine at the Raincity Grill, which boasts unrivalled views of English Bay. Banff is just a short drive away from Calgary, and is certainly worth the trip when you consider its great restaurants, romantic hot springs, and world-renowned Rocky Mountains. Take a break from starting at each other long enough to ride the Banff Gondola up to the top of Sulphur Mountain, where you can enjoy a drink while basking in the panoramic views. Then warm up with a dip in the nearby Banff Hot Springs before heading to dinner at the famous Grizzly House (we recommend the fondue). Escape the rush of the city and hop on the ferry to Toronto Islands -- where on the way over you can check out each other and amazing views of the city skyline. If your head’s not already spinning you can take a ride on The Scrambler at Centreville, the island’s quaint amusement park. Or rent a bike and head off the beaten path by exploring some of the less touristy areas. Finally, stop in at the Rectory Café for a delicious dinner and drinks before a sunset sail back to the city from the Wards Island dock. 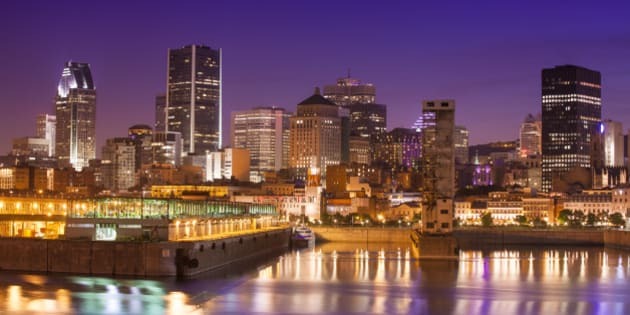 There are few places more romantic than Old Montreal. Take a stroll through the historic district, and explore the area’s unique shops and beautiful architecture along the way. You can satisfy your sweet tooth at one of the charming patisseries before setting the mood with some oysters, lobster and fine wine at the lively Barroco Restaurant. Then, in true Montreal style, follow it up with drinks, music and dancing at Le Piano Rouge. Don’t be afraid to get a little wet along Halifax’s famous waterfront. You can then satisfy a different urge at one of the tasty food huts like The Battered Fish, before embarking on a harbour cruise aboard a tall ship. Cap off the evening with a cocktail from another era (including The Golden Age, Prohibition, and Repeal) at The Drawing Room.